Today’s Nintendo Direct revealed one of the most discussed Zelda titles the community has seen for a long time, this being The Legend of Zelda: Majora’s Mask 3D. Nintendo started out it’s November Livestream by showing off said title in all its glory. The game features a similar style to the previously released Ocarina of Time 3D, with improved character models, textures and sound. The European edition of the stream also announced that a special edition will be released in said region containing a metallic pin, a poster and a steel box. Watch a full video of the teaser above! 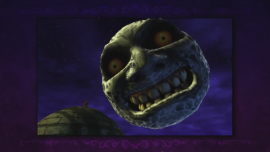 For further news on Majora’s Mask’s highly anticipated remake stay right here at Zelda Informer!